I’ve done this before, this is updated. If a GM did decide to ever work on our profession. This is a cheat sheet for getting them started. I would say most of the items on here have broad agreement among sorcerer players, some are just my ideas though. It needs to be brought into the fold in regards to GS4 design principles. IE - damage modified by lore. Or, in this case, mana controls. Look to spells like 302 for an example. It doesn’t need to be huge, just a moderate increase in damage for added mana control training. Someone, please, fix, it. 703, 706, 717, 713. We were told 7 years ago that phase, when self cast, would provide us with manuever defense akin to 911, 313, or 1109. It does not. We are the only pure without a manuever benefit as such. Also, someone had the idea of 704 preventing rapid decaying critters from decaying so fast, seems like a good idea to me. It also needs lore modifiers, it currently has none. Either do mana controls or necromancy. Also, make it a dual cast spell like Web, with a bolt version. No change, other than, fix the ithzir. It isn’t mental. No change, or possibly move to 713. 1. Change the messaging. The spell needs a messaging update probably more than any other spell in game. It has messaging that makes it look elemental, but it isn’t. It needs better messaging. 2. A lore or mana control tie in would be welcome. The one sorcerer attack spell that is built right in regard to lore standards. No change needed. 1. Allow more control over unlocking. Allow us to tap the runestone to select the spell slot we wish to unlock, like how my book works. 2. Change dikar’fyn to do any spell up to level 50. No fresh above level 20 scrolls exist outside of the arcane circle, so let us use the rune on them. 3. Lots of good auction item ideas with this spell. x per day runestones (not a pouch that makes them, but like a quiss’fyn with 5 uses a day). Or magical fountain pens with infinity ink. Those are all other posts though. Or, possibly, if we get Harbinger for 735 we won’t need another CS spell, so, a utility spell of some sort. Something to do with runestaffs maybe (something where we make something would be nice), or maybe even a buff of some sort. We have very little utility & buffs in our circle. No changes, except, I think it should get a TD pushdown back. Honestly. It is a 17 mana spell, that at most stuns unless you’re severly underhunting. It deserves a pushdown, or a reevaluation of thresholds. No changes, maybe do some more with demonology, make sure it uses the disruption crit table instead of unbalance (unless you have already done that, honestly, I don’t use torment much). 2. Make flying creatures more susceptible. They’re flying, they are relying on air pressure to stay flying. A sudden drop in air pressure should mess them up. Instead we have stupid things like griffin immunity to open implosion. It makes absolutely no sense for a griffin to be able to outfly a vacuum. It would be like a fish winning a race on a dry creekbed. How are they swimming? There is no water. Lets not do a GS3 thing and have two spells for one thing. We don’t need minor summoning and major summoning, we need summoning. If you do not want to adjust costs, you can adjust requirements. So, cut all lore thresholds in half for demon summoning. 2. Change the uncommon rune system. Allow any sorcerer to summon any demon by name, or try. Have runestones merely give bonuses to success. So, with enough demon lore, you can summon demon X, but if you have a demon X runestone, you need 20 less lore ranks. 3. Add a new demon attribute for all demons called TEACH, or LORE. Whatever. The idea is, if you have a demon summoned, it helps you with other demon tasks, thus giving you an effective lore benefit. Some demons can be better teachers than other. This is one reason why I did not say to cut demon lore requirements for phase, or cloak of shadows, only 725. The idea being a sorcerer will have an easier time with lore with those spells (again, to make up for our costs) by summoning a demon first. 4. Allow the teach ability to extend to other sorcerers in your group…. if possible allow this form of enhancing to break the current +50 skill enhancive limit because…. 5. Add new major demons with new awesome abilities to the demon system. 6. You can put these demons at really high lore requirements. What about a demon that requires 300 or 400 lore to summon? Impossible you say? See #4 and #5. So, to summon such a demon, you’d need a group of sorcerers working together. Using the enhancive system as such allows you to create the need for a ritual and teamwork without actually having to code such a requirement. Just do it with lore thresholds. Someone with 100 lore ranks might be able to summon a weak major demon (still better than any current demon). Someone with 200 a middling one. But to get the highest guys you’d need groups working together. You could do some ridiculous banaltra demon at 1000 lore requiring a group to get together, summon minor demons to teach, then use that knowledge to summon major demons that are even better teachers, then finally summon the ridiculous banaltra demon, who could crap out high level enchant potions or something. Teamwork, ritual, complexity, all without needing another spellslot, hooray. I suggest having contests to design the major demons and a few good brain storming sessions to think of abilities. Basically, this allows us to cast any other spell as a mass spell. Think rangers, think bards. This is our mass CS spell. Costs can be worked out in commitee. I personally think we should be able to teleport into almost any restricted area in the game using high quality chalk. Broken lands, the rift, darkstone. It makes sense from an IC perspective. High quality chalk should have no barriers. But this isn’t a huge deal. I recall seeing someone post that they wish sorcerers had an easier way of getting mana because sacrifice is so marginal. I personally think sacrifice could merely be tweaked. And we had a really productive brainstorm about it maybe like 18 months ago, or 2 years ago, before Evarin quit anyways. But of course, no GM participated or acknowledged us and so, I think those ideas are probably gone now. So… here is the spell. A reverse mana node. Instead of increasing mana return for everyone in it, it DRAINS mana from everyone in it. Except the caster or those grouped to him. The drained mana, of course, going to the sorcerer. How much is drained and recovered being then based on mana control skills. Additionally, the deadpool corrupts the essence of the entire area partially, making any non 700 circle spells not cast by the caster group have a chance of failing as if the caster had 703 cast on them. Base the chance on lore or mana controls or something. I could give it a pretty significant chance though. If you’ve read the ever-so-ponderous Wheel of Time Books… (and it has been a few years for me) like that one dirty place where the source is corrupted. Additionally, I could see any 700 spell cast (including by critters) To have a CS boost, while in the deadpool. Finally, the pool would break any sanctuary when cast, and prevent new ones from going up while active. Call the spell, magical poison. Addendum - the downside of deadpool is that you’re spending 50 mana to make a spot you cannot move from, modern hunting techniques typically involve almost no such camping, so that is the downside. Though, it would be interesting if we could cast the deadpool, and then walk away from it while still be “Beamed” the mana it drains (maybe less, at distance, and of course the CS boost etc would no longer apply). Like how we can 701 something and walk away and still get blood. Such a feature is worth discussing. I could also see it limited per day like how 1150 and 350 are. Definitely though, each sorcerer should only be allowed one active deadpool at a time. And yes, casting it in town would generally be a bad thing - though having the constable arrest you for such would seem like bad comedy. Does he really understand high level magic like that? It’d be far more better (yes, more better) if you got tossed in a guild jail by someone from the guild for doing that sort of thing. Addendum 2 - a nice ability for a new major demon could be a walking deadpool, whereas they permanently have one that of course follows them wherever they go. I collected data from myself to get a decent sample size. All casts are on an Ithzir Seer, if you want to view the raw data, which includes critical data (if someone wants to analyze criticals, or compare damage only when the critical is the same, have it) go here. Otherwise, here is the result, click for a larger picture. 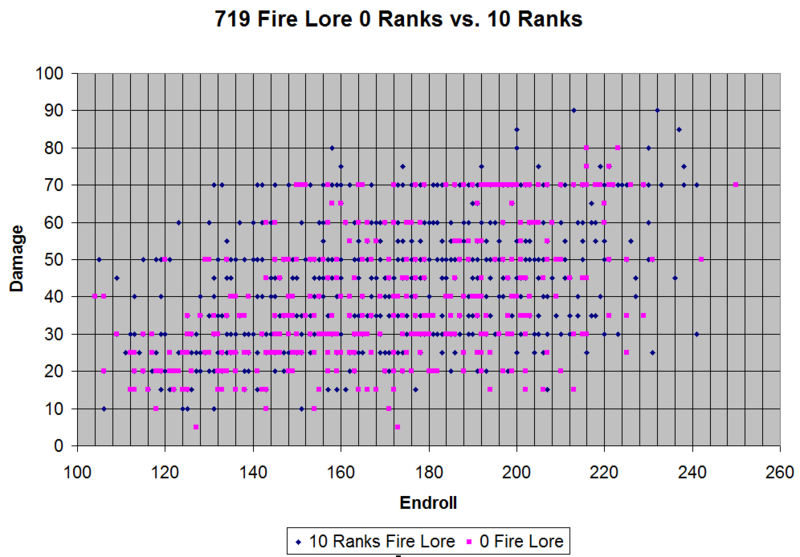 Sample size of 900 some casts, 380 with 0 lore ranks, the rest with 10 lore ranks. 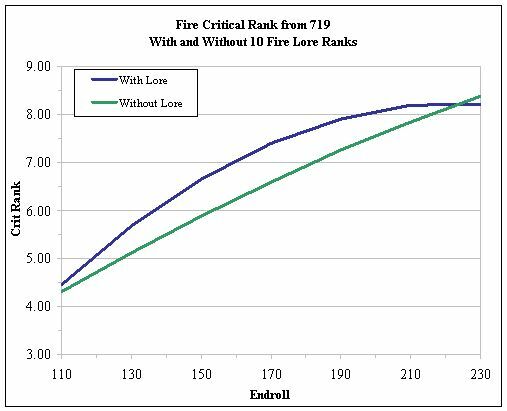 The below graph was done by Denil with my data after he plugged in the crit ranks. I also did the following data analysis.